France's Louvre Museum says it is open to the idea of returning ancient Egyptian fresco fragments at the centre of a row with Egyptian officials. Earlier, Egypt's head of antiquities Zahi Hawass told the AFP news agency that the Louvre had bought the fragments knowing they were stolen. 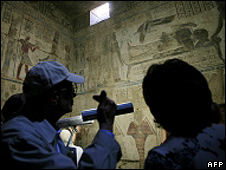 Egypt had severed co-operation with the Louvre, pending their return, he said. The Pharaonic steles, on display in the Louvre, are reported to be from a tomb in the Valley of the Kings, near Luxor. A Louvre official said "the process for returning them has been engaged". But France's National Scientific Commission for Museum Collections still has to give its approval before they can be sent back, AFP reports. Ancient Egyptian artworks and relics are displayed in many of the world's top museums, but in recent years Egypt has stepped up pressure to repatriate some of them.